BUT, as you can see from the picture below, the Etap has twin rudders, and while she can turn on a dime this also means that she's a bit heavy on the tiller, especially when healing. I'm intending to do some offshore sailing in the Baltic this summer, so I want the pilot to be 100% reliable. Which has made me wonder, even though in theory the ST1000+ should be capable of steering a boat up to 250% as heavy, if I shouldn't go safe and get the ST2000+, which is rated for 4,500 kg / 10,000 lbs - but which is of course more expensive and probably draws more power. Am I just being a nervous ninny? Is the smaller model perfectly adequate and I should stick with that? Or is there some other better option that I'm missing altogether? All advice very welcome - and thanks! I smuggest you google San Fransisco singlehanded sailing society and download the free and excellent book on singlehanded sailing and how to balance your boat through sail trim. Your tiller pilot will have much less work to do. Pretty boat. Patrick we have a ST2000 for use on our 5100kg (cruising weight) 31ft yacht. Works perfectly on our cross channel trips and doesn't seem heavily worked. As Raybrett points out sail balance is important and worth spending a few minutes getting right before a long course. Just be aware that they need a waterproof cover if its raining, otherwise a superb bit of kit which can be connected and disconnected a quickly as using an old record player arm on a record. We are always looking for a second ST2000 as a spare at a bargain price but they hold their price well. I would get the ST1000, sit back and enjoy, great bits of kit for leaving in control whilst you put the kettle on. There is an adjustment called Rudder that lets you adjust just how much rudder the boat uses per amount of degrees off course to maintain course. There is also a Yaw setting that controls the number of degrees the boat can be off course before the autopilot takes action. Many autopilots can also learn on their own just how much is enough rudder to maintain course. I have a simrad TP2000 on my 20' nimble and on my 48' ketch. They work great! I think you'll get a better deal on a Simrad if you shop on line. Check them both before you buy - one is as good as the other for what you're doing. Simrad also makes a TP1000 which doesnt have the remote capability which is nice - you can steer the boat from the bow if you want. The one on my 48 drives the Monitor wind vane when I'm motoring - works like a dream! Thanks all for the super tips. I've downloaded the SSS singlehanded sailing book and it looks like a real treasure trove - already enjoying reading it! As far as the tiller pilot, after this advice and further reading online (with a lot of votes on both sides both for and against the Raymarine ST1000+ and the currently named Simrad TP10 - apparently a hotly contested issue with dedicated advocates on both sides) I'm leaning toward the Raymarine ST2000+. It seems it's based on a different and a far more robust mechanic than the ST1000+ (re-circulating ball drive instead of lead-screw and nut drive). A Raymarine engineer apparently once directly told one person writing online that he thought it was a far superior construction. And with the newer + line Raymarine seems to have improved on the water-resistance issues (although from the sounds of it it would still be a good idea to keep the unit in some kind of water-resistant sock on wet days). Also, according to the manual the ST2000+ draws the same amps, while the unloaded lock-to-lock speed is 4.5 seconds instead of 8. It's a bit more expensive than the ST1000+ and probably a bit over-engineered for my boat, but I hope the extra cost will be worth it in terms of peace of mind when I'm counting on it. What sells me on the Raymarine over the Simrad is the display showing compass course, etc. Just seems simpler and easier to use - but I can definitely understand wanting to do without that for the cost savings. Thanks again all for the great advice. Very much appreciated! Go w/ the Raymarine, I use a ST 1000 w/ good luck. Have had both, Simrad is cheaper and works well, But very noisy. St 1000 is great and will work w/ remote. I did finally wear out the gears and belts on my Raymarine. The repair kit is only $49., I now carry two kits. Easy to repair, even at sea. If you need the part #, just yell and will find it for you. Trim sails for best balance, you'll know when it's right, does'nt work it self to death..Michael.. I just bought a TP2000 for the 48'er last summer and had to order the remote in from Simrad, maybe I bought the last one they had????? And I dont know what you mean by too noisey - I cant even hear mine run. I've had one on my Nimble for 4-5 years. It's the same as the new one they sell. If I couldnt get the remote- I wouldnt buy it no matter what brand it is. I was really surprised at how well the thing works on my big ketch. I read about guys who used tiller pilots to drive a wind vane. I borrowed the one off the 20'er and rigged it up on the 48 to see if it wasnt a bs story. Works like a charm! Uses very little power - less than on the tiller of the 20'er by far. I had a Tiller Master on one of my old boats -42' cutter - it was junk. I bought a Ray -biggest they made- it turned into junk in a year down Island. I dont know how long the Simrad will last but so far so good! I had the same 1000 vs. 2000 debate with myself when replacing my ancient 1000. The 1000 had worked fine for many years and the electronics died a natural death. I thought about upgrading to the 2000 but the 1000 was on sale and previous one had done fine for many years. if you have the boat bucks and want peace of mind get the 2000 but its total overkill in a 21 foot boat IMO. My Douglas 32 came with an Autohelm 1000 (I believe it was the precurser to the Raymarine). It self destructed after day four of a five day maiden voyage, although honestly I have no idea how old it was at the time, and it was used / abused downwind with fairly heavy weather. I was going to replace it with an ST2000, but found an ST1000 at a very good price so that is on the boat now. Have not had a problem with it, and our boat is probably 3 times the displacement of the etap (which is a really nice boat I might add). I also had an ST1000 on a 25 footer linked to the Raymarine wind instrument which worked like a charm. I have never had any issues with water damaging any of these products. So, all that said I would rather have the ST2000 regardless of boat size, but I think functinoally the ST1000 would be fine. I would rather have two ST1000's than one of anything. Thanks for the great further input, all! I'm buying next week and will report back on how it goes after I've installed and sailed a bit! I too have an Etap 21i and am looking to add a tiller pilot. Likewise I'm leaning towards the ST2000 for peace of mind. How have you got on with yours? It would be very much appreciated if you would be able to provide some guidance as to what parts / accessories are needed and how you fitted yours? Any pictures would be a great help. First off, I ended up going with the ST1000+ after all. On balance, considering all of the arguments about cost vs performance, it just seemed better to go with the less expensive option. The Etap also required a couple of accessories for the installation (more on that below), increasing the cost - so total it was what I felt right spending. And I haven't been disappointed at all. First off, going from having no autopilot to having one is a complete revolution. 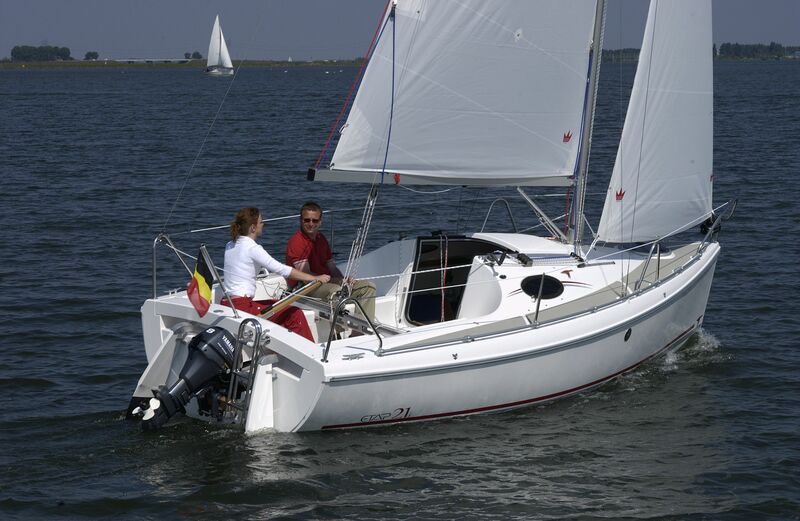 Especially on a boat like the Etap 21i, which absolutely flies off course the second you remove your hand from her tiller, balanced sails or no. Freedom! Taste that word!! Now with the autopilot engaged I can spend time up at the bow fixing a line, rigging something, whatever. It has really enabled a single-handed capability that's impossible without an autopilot. I absolutely love it! Among other things having this tool made it possible for me to singlehand offshore 100nm to the island of Gotland in the middle of the Baltic Sea, for the first time. Having done that, I realize it would have been much, much more difficult without the autopilot. Beyond this sail I've tested the ST1000+ in most sorts of (summer) conditions that are typical around Stockholm, over more than 500 nm, from flat calm to fairly wavy - from bashing into waves to running before decent-sized following seas. The ST1000+ has preformed great and always reliably, and kept us right on course. If I had to add one caveat it's with waves coming between the quarters (so, on either quarter or astern) where the boat tends to wallow a bit and swing more heavily on her course, since the autopilot lags somewhat when moving the tiller vs. what it should be doing were it human. The effect is more swinging back and forth than one would like if you were hand-steering, and this is a spot where the ST2000+, with close to half the hard-over time, might be better than the ST1000+, although I have no way to be sure about that. At any rate, left to its own devices even in that kind of sea, the autopilot still keeps you right on course, just with a bit more swinging and probably lost VMG because of it. In terms of strength the ST1000+ has no problem at all with a boat this size - there was never a sense that it was stuggling with the tiller - it seems quite strong. The ST2000+ is supposed to have a stronger (and completely different) mechanic, but given that the ST1000+ functions perfectly well I would question whether you need that for this size boat. I would rather put the money towards other equipment/an eventual replacement. The dimensions for mounting are fixed and are in the manual. At first the idea of permanently mounting the pedestal base on the stern locker bothered me. But in use it has never been a problem - in fact we even usually just leave the screw-in cylindar that attaches to this base mounted as well (although you have to be conscious of where you plop down in the cockpit if you're not using cushions or you might get an uncomfortable surprise!). We charge our single 12V battery with a 50W solar panel, and it also charges off of the outboard when that is running. On the sail to Gotland I ran the auto all night together with nav lights and the battery was still doing great in the morning, so power consumption has not been an issue. Strangely, I search through my photos from the summer and I don't have a single decent shot showing the tiller pilot at work or the way it has been installed. I have a no-sailing weekend coming up, but should definitely be by the boat within the next two weeks and will be sure to shoot some pictures and post them for you here so you can see how I've mounted it. In the meantime, best of luck with this and let me know if you need any more info - very happy to help! Thank you very much for getting back to me with details of how you installed your tiller pilot and what your experiences have been with it If you are able to send some pics next time you are on the boat that would really help. I am based in the UK and have the Southampton boat show coming up next month so I will look to see what offers Raymarine have before I take the plunge. One Etap I saw when looking at ones to buy had their tiller pilot mounted on the vertical face (back rest) of the locker cover with a bracket and extension piece. the extension piece screwed into the bracket putting the mount in the right place for the tiller pilot pin. They said this was factory fitted by Etap. Have you or anyone seen or have any photos of this type of mounting as I am not too keen on putting a fitting through the teak.